This entry was posted in DE and tagged nachrichten on February 27, 2013 by FEMEN. This entry was posted in RU and tagged новости on February 27, 2013 by FEMEN. Eloïse, Femen et "guerrière d’un nouveau genre"
This entry was posted in FR and tagged nouvelles on February 27, 2013 by FEMEN. Ma era necessaria tanta violenza contro le Femen? This entry was posted in IT and tagged notizie on February 27, 2013 by FEMEN. This entry was posted in DE and tagged nachrichten on February 26, 2013 by FEMEN. This entry was posted in PT and tagged notícia on February 26, 2013 by FEMEN. 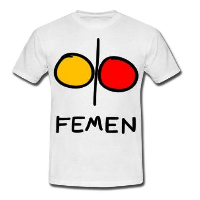 This entry was posted in IT and tagged notizie on February 26, 2013 by FEMEN.